So I spent a little extra time in an airport yesterday, and in between walking laps for fun (when my flight was delayed), I watched people carry their belongings. Some push their rolling suitcases, some drag their bags, some push on carts, and everything in between, but one thing that worries me is how your shoulder is involved to PULL a bag on wheels (This includes cello and other rolling objects). Last month I covered how carrying things (cases, purses,etc,) affects us, so let's look at how pulling things can affect us. Basically, you can pull with the palm of your hand facing forward (shoulder externally rotated) or thumb towards your hip, palm facing back (shoulder internally rotated). Now theoretically, all movements of the shoulder are valid, but given our habits of poor posture, and internally rotated shoulders, most of us should not be pulling weight in internal rotation. Musicians already are prone to nerve impingement and other maladies, simply from overuse, misuse, and abuse, but we don't think about how we carry our instruments that often. 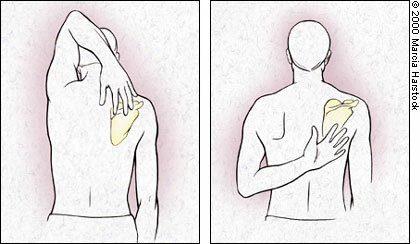 Pulling your case with your shoulder externally rotated is the most stable and supported position for the shoulder. Period. That means thumbs out to the sides, palms forward. Sustained pulling in internal rotation, especially when coupled with misalignment and shoulder shrugging = possible pain in the shoulder and neck. Image of disembodied torso pulling a bag in EXTERNAL ROTATION courtesy of consumer reports. It sounds super simple, but this above image shows a good way to pull a case, and the image below shows a less stable position. I realize this is perhaps one of the least popular topics to discuss, but quite practical, seeing as most people in airports are juggling a suitcase, a cell phone, a small child, a purse, and a bag of food. Trust me, you don't want to be googling the question "I hurt myself pulling a suitcase (or carrying a handbag). " (There's not a lot of resources for that, by the way). 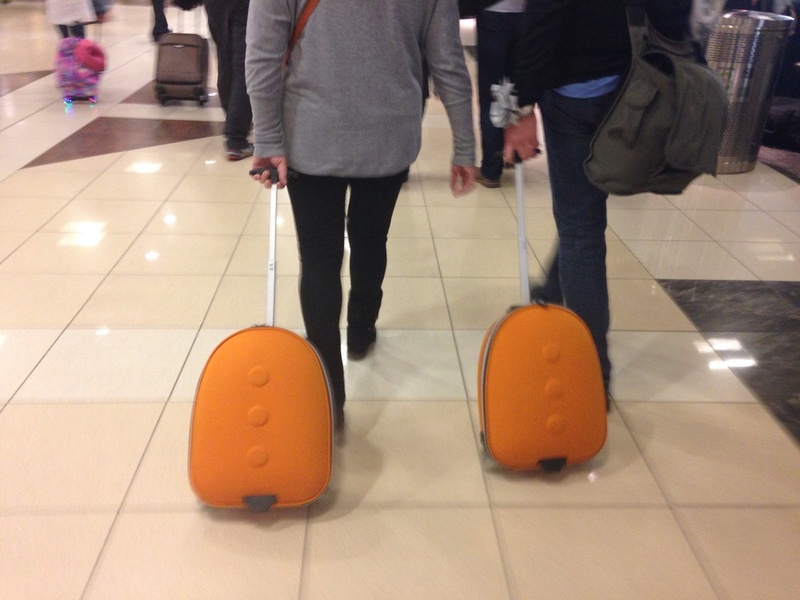 Notice that this couple, with their matching orange lego suitcases, have different pulling techniques. The woman on the left is pulling in internal rotation, and the person on the right is pulling in external rotation. They both have purses/crossbody bags, so who's going to have a happier shoulder at the end of the travel day? Person on the right, for the win! Try both positions the next time you travel (or pull your case) and see how each positions affects your strength, your posture, and your ability to pull. Image of matching suitcase people courtesy of me, following people in the airport.